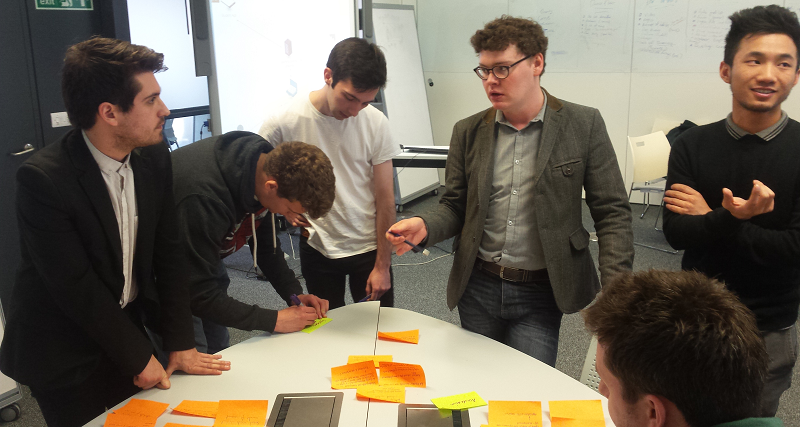 In February we ran a workshop in London with university staff and a couple of students to gather requirements for a student app. I’m now carrying out sessions directly with students to find out what they would find most useful. Yesterday I had the pleasure of visiting the University of Lincoln at the invitation of Marcus Elliott. The students were from a variety of levels and backgrounds, ranging from engineering to drama. 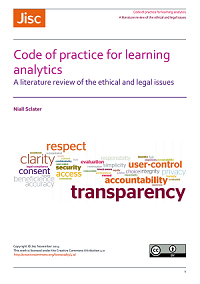 Most of them had little idea of what learning analytics was about so I introduced the session by describing a few things that were being done in the area – attempting not to influence their thinking too much. Marcus and I had agreed that we were better starting with a blank slate and then looking at whether there was any common ground with the conclusions of the London workshop. 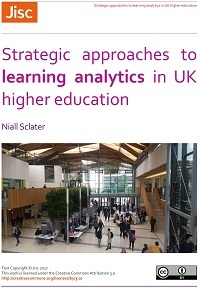 As with the previous event it was a challenge to keep the group focussed on the applications of learning analytics without straying into all the useful things that apps could do for students. I felt it was better though just to let the ideas flow, and not to impede the creativity in the room. The students came up with ideas for functionality, put them on stickies, and discussed them with a partner. Then they all came together and spontaneously grouped the ideas into four categories: academic, process of learning, social integration and system monitoring / institutional data. 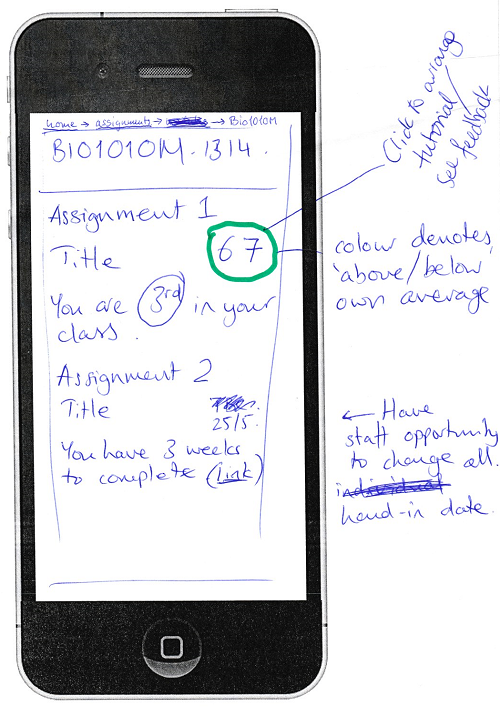 At this stage we didn’t want to look too much at presentational issues however we provided the students with blank smartphone screen templates to scribble on in order to focus them on what the functionality might involve. Inevitably there was a focus on assessment and, as with the London workshop, up to date data on grades was thought to be one of the most useful things a student app could provide. 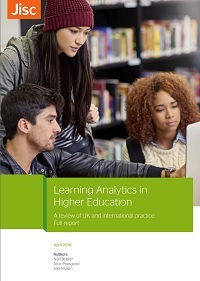 Is this learning analytics? I don’t know – but ideas such as showing your ranking in the class and being able to manage processes from this screen such as clicking to arrange a tutorial would certainly be useful. Other ideas included calendar reminders of assessment due dates and exams. The app could provide a one-stop shop for all of a student’s results. It could also show what percentage of assessments the student has completed but also what grades they need to obtain in future assignments in order to receive different levels of degree award. 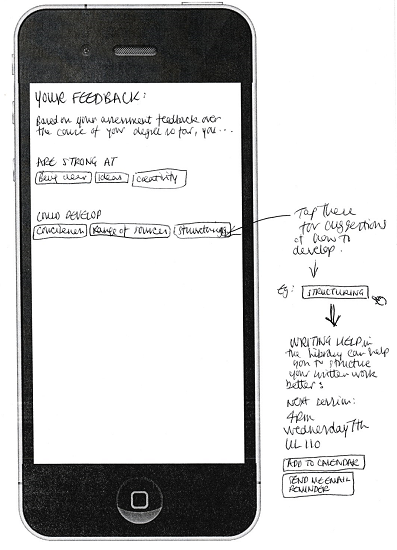 Better feedback to students from their lecturers was also thought to be something the app could facilitate. This student neatly links personalised feedback to more detailed suggestions on how to improve particular skills e.g. academic writing skills and options for self-development such as links to help sessions which could be placed directly into the student’s calendar. 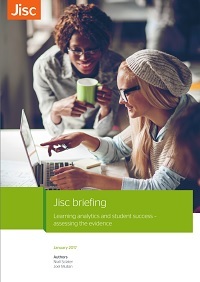 Giving real-time feedback to lecturers rather than waiting till it’s too late via student surveys was another option. This could help speed up improvements to courses. Providing reading list functionality was also popular with the attendees. Here students are presented with metrics showing how much they’re engaging with the reading list on each of their modules. Reading list functionality could also include reviews, comments and recommendations from other students (perhaps building on the features of goodreads). They also suggested Amazon-style recommendations for reading e.g. “if you liked x you may like y”. How you spend your time was another application which the students thought could be useful. 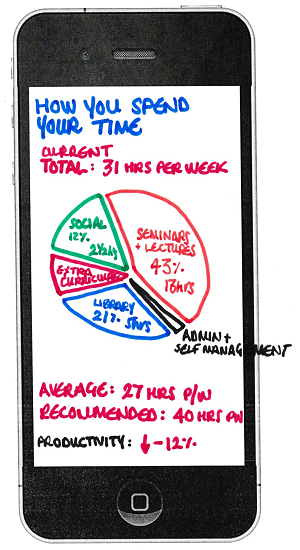 This example shows the percentage of time spent by the student on various activities. 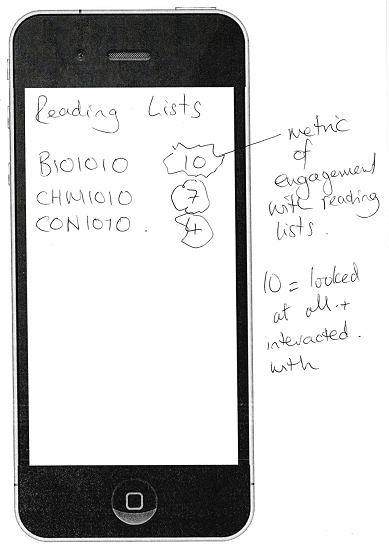 The data itself could be assembled from timetables, calendars, geo-location and self-declared activity. Recommendations on how much time should be spent on different activities could be another helpful feature. Managing event attendance was another popular option. The student could be contacted about societies and social events, workshops, guest lectures etc – all of which would be based on their interests, which they could also specify via the app. This would cut down on the amount of “spam” messages from the University which they say have led to many students not bothering to read their emails. You could invite people to events you are organising, or push events to their app – again based on the interests they have specified. Rating events would also be a useful feature. 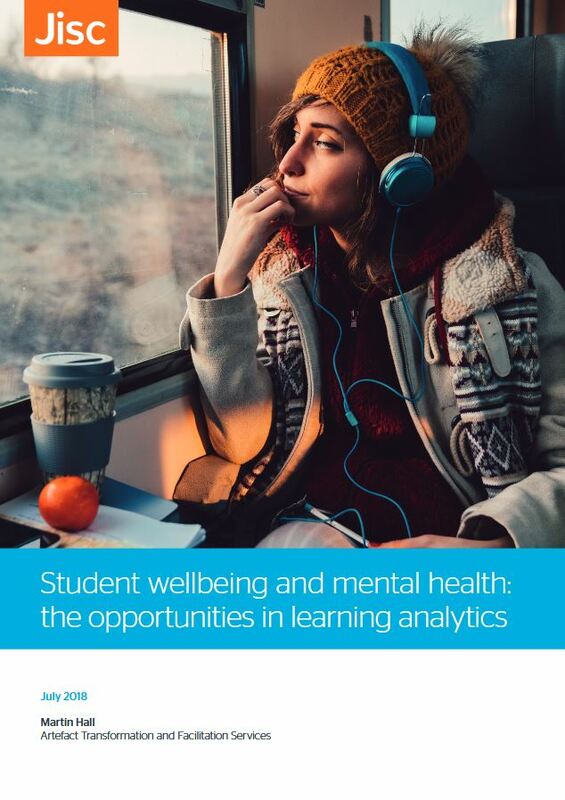 If analytics determined that a student was becoming disconnected the app could introduce them to opportunities such as open day volunteering. There was a suggestion that University and Student Union data could be combined to suggest such opportunities based on career aspirations and interests. Another option is to use the app to check-in to lectures, perhaps automatically using geo-location, and to enter reasons (such as illness) for non-attendance. There could also be notifications on lecture cancellations. The app could contribute the events you attend to a portfolio of attended lectures. Finding other students with similar or complementary interests was a popular suggestion too. This idea came from a postgraduate student who recognised the value of interdisciplinary contact so that you could look for someone to help you in an area you were less familiar with. You could specify what skills you have on offer and what you’re looking for assistance with. 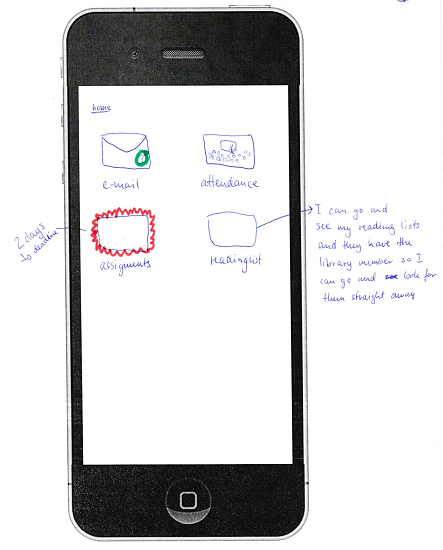 Though we didn’t ask her to do it, showing how the different functions of the app could be accessed was important to this student in order to understand how everything would fit together. Another generic suggestion was that the app should keep you logged in all the time. So all in all some great suggestions from this group of students in Lincoln. 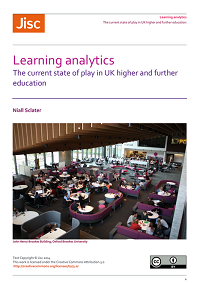 Some of them aren’t what are normally considered learning analytics applications but they all rely on data – some of it new data such as students being able to specify their interests in more detail in order to receive targetted materials and details of events. There’s a lot of complementarity with what staff thought of in the London workshop. It’ll be interesting to see now what students at other institutions come up with. 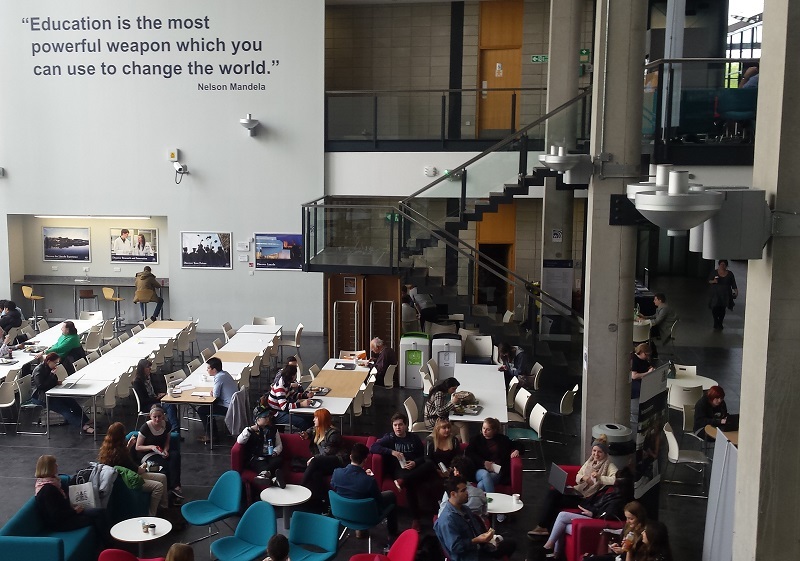 Posted by Niall Sclater on April 29, 2015 in Student App. I’m very interested in your article as we have developed plugins to Moodle to extract this data, which is very rewarding considering your students have highlighted this information as useful. Next week at the Moodle Moot, we will be looking at customising the home page to present all of this data, allowing the Moodle app to make it user friendly for the student. Thanks Mark. If you’ve got a link to further information on your Moodle plugins feel free to post it here. I’m curious to know what was the gender breakdown of the student group and if you noticed any difference in focus across these lines? Good question. There were only I think two females present out of around nine students (and they don’t appear in that photograph!) The “Finding other students with similar or complementary interests” was suggested by a female postgraduate student. Wanting to organise “How the different functions of the app could be accessed” was the suggestion of the other female. Most of the other suggestions came from the males. Please draw your own conclusions from that. While I was aware of the gender imbalance I hadn’t particularly thought about how that might reflect the requirements so thanks for pointing that out – we should attempt to ensure an appropriate gender balance in prioritisation, user testing etc. 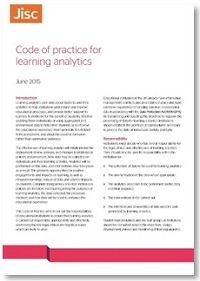 Isn’t there a request to have an integrated learning records from different applications and resources?